Instead, the dating of the festival is dependent upon the timing of the עמר (omer) wave offering, as it relates to the seven days of Unleavened Bread, the interpretation of key words, and the inferences provided from context and statements made in Scriptures. The result of this method was several varying views and the entire subject became a matter of much controversy. Our next effort, therefore, is to examine important scriptural statements that must be used to determine the original practice of Pentecost and to investigate the approaches used by the various Jewish religious schools. The calculations for keeping the Festival of Weeks was yet one more area where those holding to the Aristocratic view sharply opposed those advocating the Hasidic construct. Their dispute centered upon the interpretation applied to Leviticus 23:11 which commands that the omer offering should be waved “on the day after the Sabbath.” The meaning of the word Sabbath as found in this verse became the source of much contention. As a result, post-Biblical Jewish traditions soon varied concerning the day on which the sickle was to be put into the first corn of a year’s harvest. Four different interpretations arose: two with a majority following and two with a minority following. • Aristocratic (majority) view: the Sabbath referred to is the weekly Sabbath. The omer wave offering always occurs on the first day of the week falling just after the festival day of Passover. • Quasi-Aristocratic (minority) view: the Sabbath referred to is the weekly Sabbath. The omer wave offering occurs on the first day of the week falling just after the end of the seven days of Unleavened Bread. • Hasidic (majority) view: the Sabbath referred to is the high Sabbath festival day of Passover, which for the Hasidim is Abib 15. The omer wave offering, therefore, always occurs on the 16th of Abib (Nisan), the day after Passover, no matter which day of the week that might be. • Quasi-Hasidic (minority) view: the Sabbath referred to is the high Sabbath festival occurring on the last day of the seven days of Unleavened Bread. For these quasi-Hasidic advocates this date is always Abib 21. The omer wave offering, therefore, always occurs on Abib 22, no matter which day of the week that might be. To begin with, we shall quickly dispense with the two minority constructs. These two views were originally advocated by some of the smaller Hasidic groups and a few others strongly influenced by them, such as the Essenes, the Qumran Covenanteers, the Ethiopian Falasha Jews, the Mishawayhs, and at least one Syrian group. As we shall demonstrate, they are clearly aberrant and do not reflect the original meaning of the Levitical text. One minority view is a quasi-Aristocratic system found in use among those at Qumran and in the Book of Jubilees. The advocates of this view used the Passover system of the Hasidim but, most likely due to their support of the Zadok line of priests, retained some Aristocratic leanings. Like the Aristocratic groups and those that followed them on the Passover issue, the advocates of the quasi-Aristocratic Pentecost system understood the instruction found in Leviticus 23:15 that the Khag of Weeks was to be kept on “the day after the Sabbath,” as referring to the weekly Sabbath. Therefore, the khag of the 50th day must always fall on the first day of the week. The tenet that it must always be waved after the seven days of Unleavened Bread, therefore, is manifestly wrong. In this interpretation, the Sabbath of Leviticus 23:11 is not perceived as a weekly Sabbath but, as the Pharisees claimed, as a high Sabbath and festival day. Yet, it too fails to consider Joshua 5:10-12, by also always placing the first day of the seven weeks beyond the seven days of Unleavened Bread. We are now left with the two majority systems: one advocated by the Aristocratic groups—the Sadducees (and their Boethusian brothers), the Samaritans, and the Karaites—and a second practiced by the Hasidic Pharisees. And you shall number for yourself from the day after the Sabbath, from the day you bring in the omer wave offering, they shall be seven complete Sabbaths, until the day after the seventh Sabbath. You shall number 50 days. “The day after the seventh Sabbath” can only mean the day after the seventh weekly Sabbath day, for there was no other Sabbath or high Sabbath day occurring at this time. This detail is further supported by the expression, “they shall be seven complete Sabbaths.” The words “complete Sabbath” is a reference to a complete week ending with a Sabbath day. Seven complete Sabbaths, in turn, equal 49 days. The first day of the 50 days, accordingly, must also fall on the day after the weekly Sabbath. The differences between the Sadducees and the Pharisees were also expressed by the Menahoth portion of the Mishnah. This statement is important because it reflects the early Sadducean (Boethusian) position that the omer of barley could not be reaped on the festive day of Passover. Yet, the Pharisees allowed that it could be reaped on the weekly Sabbath day. The Pharisees could not deny this regulation and were careful that the sun had already set on their festive day of Passover before they reaped their omer of barley. Otherwise the Sadducees would have charged the Pharisees with error regarding their own Hasidic interpretation of which day was the festive day of Passover. The Aristocratic interpretation of the seven Sabbaths is also basic to understanding their view. They define the “seven weeks” of Deuteronomy 16:9, by the “seven complete Sabbaths” of Leviticus 23:16. The important features of the Aristocratic view for counting the 50 days of Pentecost are, as a result, well-established. The omer wave offering could only take place “after” Passover and never on that festival day; it can only take place on the first day of the week (Sunday); and it must follow a weekly Sabbath day that falls during one of the seven days of Unleavened Bread. Counting seven complete Sabbath weeks from the day of the omer wave offering one arrives at the day after the seventh Sabbath. This day is the Festival of Weeks (Pentecost). The Pharisees held quite a contrary opinion. They insisted that the statement, “the day after the Sabbath,” as found in Leviticus 23:11 refers not to the weekly Sabbath but to the high Sabbath day of Passover, which is a יום טבא (yom tob; festive day). Under this system, the Festival of Weeks came on the 50th day, counted inclusively from the 16th of Abib, regardless of which day of the week it fell on. The Pharisaic view is demonstrated in several sources. Since the 16th could fall on any day of the week, this meant that the 50th day could also come on any day of the week and not just after a Sabbath day. What then of the issue of the “seven complete Sabbaths”? The Pharisees held the exact opposite opinion to that of the Aristocrats. The Pharisees defined the “seven complete Sabbaths” of Leviticus 23:16, by the “seven weeks” of Deuteronomy, 16:9. That is, each of the seven Sabbaths represent a “week” as a period of seven days—not as a scriptural week extending from Sunday to the Sabbath. For them, this Sabbath meant a random period of seven days. Under this interpretation, each of these seven-day periods could begin and end on any day of the scriptural week. Therefore, the command of “seven complete Sabbaths” only refers to those times when Passover fell on a weekly Sabbath. On those occasions, the 16th would be a Sunday and, as a result, the 50th day of the count would also fall on a Sunday. When the Passover did not fall on a weekly Sabbath, then the 50- day count was used, disregarding the issue of counting Sabbaths. Time to finish this first installment of “Pentecost Clarity I” everyone. When ready just proceed on to “Pentecost Clarity II” for the wrap-up. 1 The Qumran community had a fixed solar calendar whereby this Sabbath always fell on the 26th of Nisan and the Festival of Weeks always came on Sunday the 15th of Siwan (THP, pp. 41, 235, 247-251; EJ, 14, p. 1319; DSSE, pp. 43f; BCal, pp. 25-28; EEC, pp. 119f, 1b. n. a). Also see Jub., 1:1-4, 6:17-22, 15:1f, 16:13, 44:1-5, where 29 days appears to have been used for the second month, placing the festival on the 16th day of the third month (?). 2 See FSDY, Chap. X, pp. 165ff. Josh., 5:10-12, notes that the Israelites ate from the new crop on Abib 16, which makes the omer wave offering occur on that date, well within the seven days of Unleavened Bread. 3 THP, p. 255; EEC, pp. 119f, 1b. n. a; BCal, pp. 24f; JE, 5, p. 328. 6 The term יום (yom) means “day” (HEL, p. 105); טבא (tob) means, “happy, prosperous . . . valuable . . . goodness . . . wealth . . . prosperity . . . beauty” (HEL, p. 99), “joyous, glad . . . pleasing, desirable” and “(morally) good” (CHAL, p. 122). Therefore, יום טבא (yom tob), being a morally good day, came to be applied to a “feast-day” (CHAL, p. 122), cf., 1 Sam., 25:8. This expression was used by the Talmudists and in the Aramaic writings for a joyous and morally good day, i.e., for the high Sabbaths. 7 See our discussion below under subhead “Pharisaic Pentecost System” and our next post. 8 THP, pp. 248f; Danby, Mishnah, p. 506, n. 1; NBD, p. 179. 9 EJ, 14, p. 1319; JE, 9, p. 593; Danby, Mishnah, pp. 213, n. 12, 506, n. 1; BCal, pp. 12, 18, 19–24; EEC, pp. 119f, 1b. n. a; NBD, p. 179. 12 The Karaites, who followed System C—which held the hybrid view combining many of the Aristocratic concepts with those of the Hasidim—argued that the “day after the Sabbath” could include the festive day of the 15th (KAEEL, pp. 215–217). This allowance may well stem from the more ancient Aristocratic view that the 14th was the true high Sabbath of the Passover. 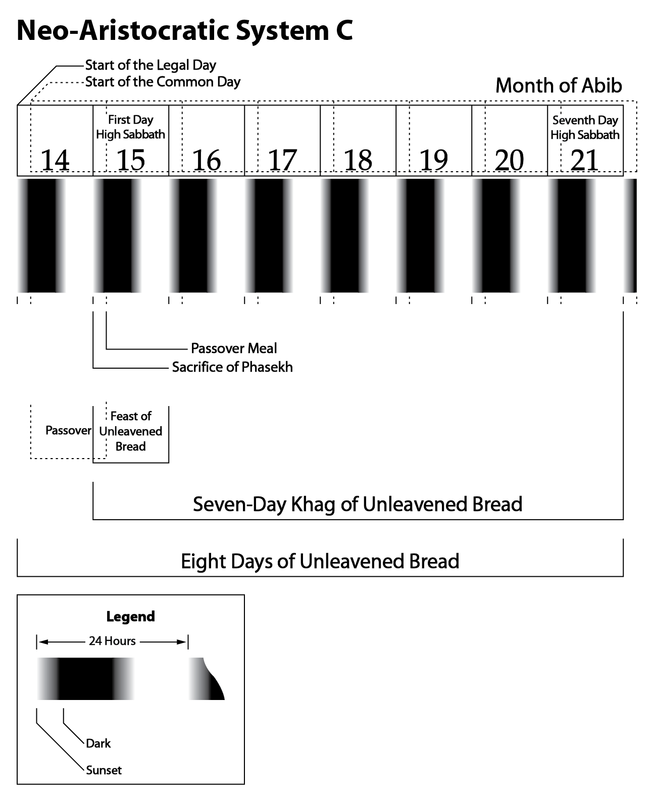 This earlier concept was then merged with the Pharisaic view that the seven days of Unleavened Bread extended from the 15th to the 21st of Abib. As a result, the 15th was allowed as a day of the omer wave offering among the Karaites though disallowed by the traditions built up by the Pharisees. 13 Men., 10:3, cf., 10:1. 14 Lev., 23:5-8, and Deut., 16:1-8, deal with the Passover and its requirements, followed by Lev., 23:9-15, and Deut., 16:9, which relate to the omer wave offering and the count of 50 days. 15 Al-Kirkisani, 1:7; KAEEL, p. 50. 16 THP, p. 254; STE, 2, p. 20; DJS, 1, p. xxiii. 18 Al-Magribi, 12:7-8; KAEEL, p. 217. 19 Lek. Tob, Lev., 128f; KBFY, p. 277. 20 EJ, 14, p. 1319; JE, 9, p. 593; BCal, pp. 18f; EEC, pp. 119f, 1b. n. a; Danby, Mishnah, pp. 213, n. 12, 506, n. 1. 21 See the LXX of Josh., 5:10-12. J. Van Goudoever points out that the Pharisees read Josh., 5:11, so that the grain mentioned there is not stored grain but the grain of that year’s crop., i.e., “On the morrow after the Passover they ate from the produce of the land.” This view, though, as he admits, is not probable. He writes, “However, in Joshua the morrow after Passover seems to be 15 Nisan and not 16 Nisan; and in the Greek version the words ‘on the morrow after Passover’ are missing” (BCal, p. 19). 22 Men., 10:3. We have quoted this passage above on pp. 248f. 25 Philo, Spec., 2:29 §162. This entry was posted on 01/24/2013, 3:17 pm and is filed under Calendar, Feast Days, Passover, Pentecost, Religion, Scriptural Calendar, Unleavened Bread, Yahshua, Yahushua, Yahweh. You can follow any responses to this entry through RSS 2.0. You can leave a response, or trackback from your own site. Thank you, Yahu Ranger! You’re helping us prepare for Yahweh’s New Year and His Festival Sacred Days. This is a good case for the Aristocratic system of counting Pentecost. Maybe a few groups will change their minds if their elders peruse your blogs.